Hollywood Exes' Andrea Kelly shared a picture on her Instagram of the children she shares with her ex-husband, R&B singer R. Kelly. 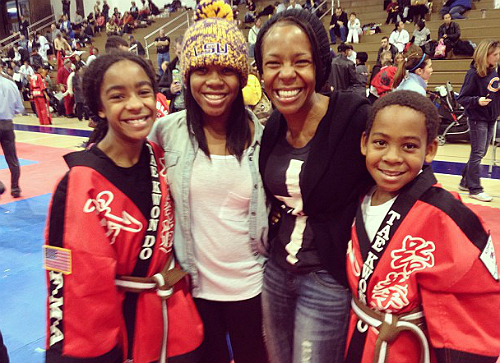 12-year-old Jaya, 14-year-old Joann (named after R. Kelly's mother), and 10-year-old Robert Jr. went to a Tae Kwon Do competition in Chicago, Illinois on November 4th. This is the first time I have seen R. Kelly's kids (I didn't even know he had kids...or a wife). What a beautiful family! R.Kelly and Andrea were married for 12-years when the R&B singer watched the movie "The Notebook" and decided it was time to step his way right out of the marriage. The couple struggled with R's infidelity and were constantly fighting and when R dared Andrea to throw her $50,000 ring into their backyard pond, she didn't hesitate for one second. The ring was never recovered and their marriage went straight down the toilet. I'm sure it's hard being a child of R. Kellys especially after he went on trial. I don't blame Andrea for shielding her children from the spotlight. Can you imagine how bad the kids would have it in the media if everyone recognized them and knew who they were? What do you think of the picture of R. Kelly and Andrea's children? Lovely family except for that whole pee incident. You had to bring that up. SMH Anyway, her genes are much stronger than his!